Over the next month leading up to the presidential election, four separate designers/design firms will tackle the not-so-small problem of rebranding the United States. A more detailed post on this project series can be read here. First up: MendeDesign from San Francisco. 1. 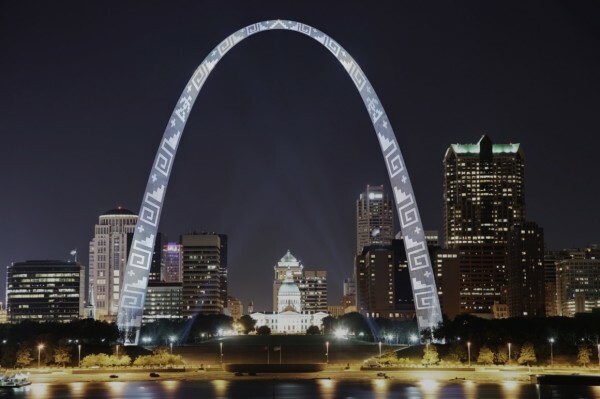 The St. Louis Arch (modified 2015). Sandblasted Navajo pattern on existing stainless steel cladding. In 2014, after a series of foreign policy debacles abroad and increasing partisan tension at home, United States President Paul D. Ryan charged newly confirmed Vice President John McCain with the development of a sweeping public relations campaign that would measurably improve perceptions of the United States both domestically and overseas (President Romney was assassinated in North Africa during a 2013 goodwill tour). To this end Vice President McCain created a blue ribbon panel of anthropologists, historians, cognitive scientists, marketing strategists, and PR/branding experts to address the problem. The panel observed that where cosmetic alterations to flags, passports, printed currency, etc. might be simple to produce and have some positive effect, such initiatives would ultimately “smell like marketing,” to quote one expert. In order to authentically demonstrate the United States’ renewed commitment to the enduring American values of peace, equality, sustainability, and respect for all peoples and beliefs, the panel recognized that the intervention would need to be executed at a much deeper level, that is, within the perceived cultural legacy of the country. Accordingly, the panel instructed the National Park Service (NPS) to modify a select group of iconic national monuments according to a specific set of instructions. These images represent the completion of Phase I of this campaign. These are now the official images for all public relations efforts and media requests regarding these national sites. The NPS requests that suggestions for modifications to other national sites be directed to their headquarters at 1849 C Street NW, Washington, DC 20240, Tel. 202-208-3818. 2. 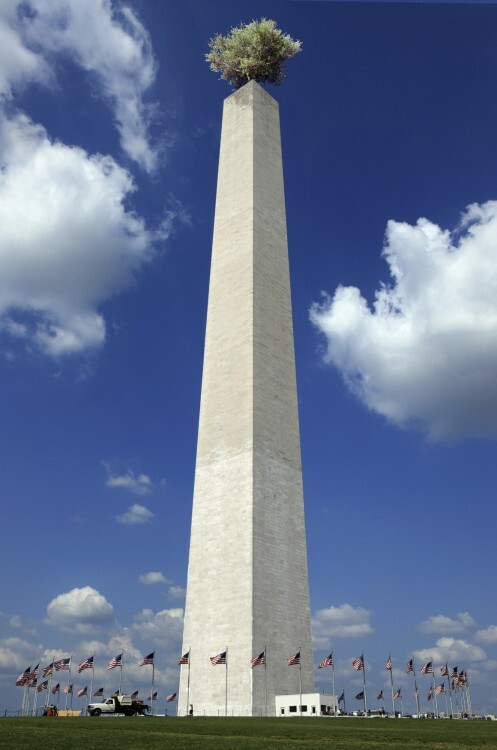 The Washington Monument (modified 2015). Truncated masonry with olive tree. 3. 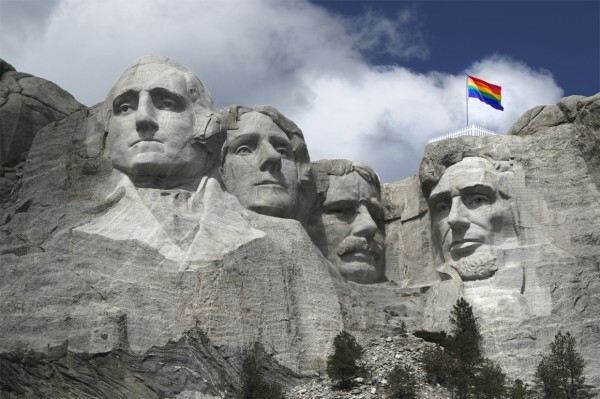 Mount Rushmore (modified 2015). Observation platform with rainbow flag. Jeremy Mende is an American designer who lives and works in San Francisco. Mende holds a BA in psychology from UCLA and an MFA from Cranbrook Academy of Art. In 2000 he founded MendeDesign, a creative practice that balances commercial projects with visual research and public art. Mende is an associate professor in design at the California College of the Arts, and in 2010–11 he was the Rome Prize Fellow in Design at the American Academy in Rome. Before his career as a designer, he skippered a mail packet off the west coast of Nova Scotia. Mr. Mende’s hypothetical situation in which Mitt Romney ‘is assassinated in North Africa during a goodwill tour’ is in very poor taste and degrades the otherwise optimistic spirit of his project. Sorry, but this is so shallow and stupid. Did I mention cliche? Hi Gemma, critique is welcome, derogatory attacks not so much. Could you say a little more about what you mean? Wow, some people don’t seem to understand satire, or irony for that matter. Interesting premise Mr. Mende. If only the US government had the self-awareness to mount such a campaign. for rebranding the State of Missouri. Or was it chosen to represent the USA as a whole? States but do something different with the stripes, ie use your rainbow idea to represent the multi-ethnic population.